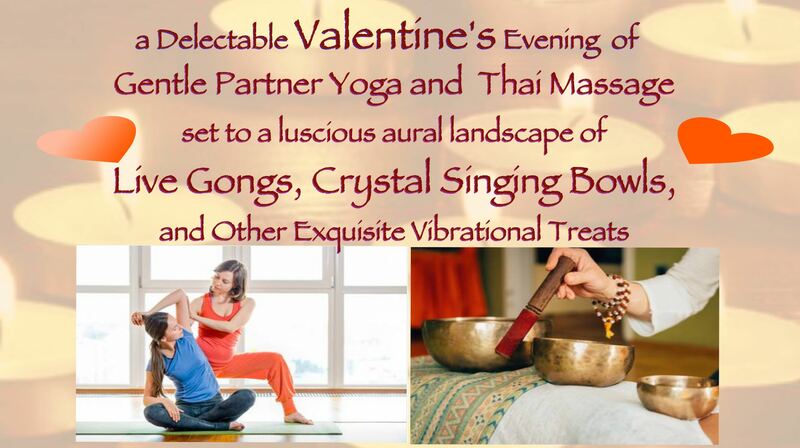 You are invited to a delectable Valentine’s evening of gentle partner yoga and Thai massage set to a luscious aural landscape of live gongs, crystal singing bowls, and other exquisite vibrational treats. Come with your sweetie or just bring your sweet self and connect with a partner in class. Enjoy and learn simple techniques that you can do at home with friends and loved ones. And then imbibe in the drinking of cacao! Early Bird Price $30 before February 1st; $35 after. Hosted by Stacy Simone, cmt and Cassiopeia of Blue Muse Sound Healing. Cassiopeia Skyfish, aka Blue Muse Sound Healing, is a sound healing practitioner living in the Coastal Redwood Forest. Her life path is dedicated to healing work. She was raised in the Pacific Northwest, where she discovered sound healing on her personal Journey. Sound healing was also an integral part of her own healing from breast cancer. Cassiopeia’s intention is to share this healing work and help others to heal. Cassiopeia trained at the Globe Institute of Sound and Consciousness in San Francisco. Stacy Simone has been practicing bodywork since 2001. She studied Thai Massage at ITM in Chiang Mai Thailand, and maintains a thriving private practice in Sebastopol, CA. Stacy also teaches TriYoga basics at Devi Yoga Center, and has an MA in Philosophy & Religion from California Institute of Integral Studies.